Each product in the Clarity BioSolutions portfolio has been designed to efficiently and effectively purify or characterize synthetic oligonucleotides used in biological research, therapeutic development and biochemical manufacturing. Technical note describing characterization of various synthetic OGNs using the new Clarity Oligo-SAX. This technical note describes how to achieve the best sensitivity and selectivity for synthetic oligonucleotide analysis via LC/MS. This technical note describes how to best use new Clarity Oligo-XT columns for high performance analysis of synthetic oligonucleotides. 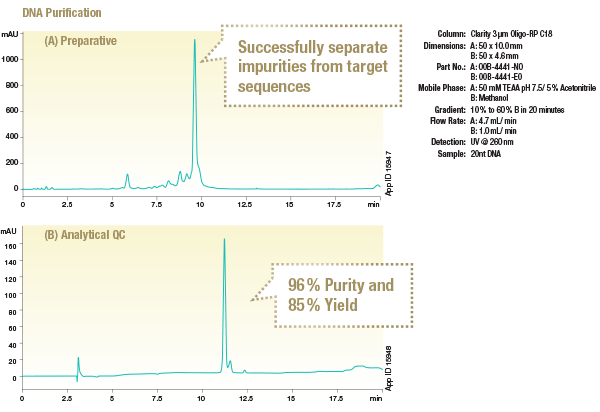 See how Clarity Biosolutions can improve your sample preparation, analysis, and purification of oligonucleotides. Clarity Oligo-RP columns have been specifically designed for the reversed phase purification of oligonucleotides with balanced hydrophobicity and polar selectivity. Available in 3, 5, and 10 μm particles, Clarity Oligo-RP allows for high capacity analysis and purification of oligos. Clarity Oligo-RP columns also allow for high loadability and deliver high recovery and purity, from HPLC to Preparative Purification. Clarity Oligo-RP successfully separates a 40mer from a 39mer DNA oligonucleotide due to its excellent efficiency and resolving power.